Someone once said "All there is in New Jersey are chemical factories and malls." Well I add that there are some fantastic restaurants in these Malls. One of which is Rosa Mexicano (390 Hackensack Ave/ 201-489-9100), a chain of Mexican restaurants that started in New York and now exists in six states on the east coast. It's popularity is less due to the authenticity and more to the quality and consistently great tasting food. Anyone that has been to Rosa Mexicano can attest that the food and drinks take you on a journey away from the hustle and bustle of the big city life and into a flavor paradise. To start off, a heavenly guacamole was delivered which paired nicely with a salsa pasilla de Oaxaca (Oaxaca is a state in Mexico where they traditionally smoke the chile pasilla). There was also a green tomatillo sauce which I mostly ignored because I wanted to douse all my food in the smokeyness of the pasilla chile sauce. The guacamole is made fresh in front of your eyes on a fancy cart. The cart's main feature was the basket of avocados that were shaped perfectly, as if picked for the Aztec kings. 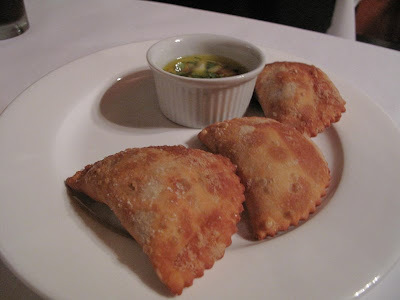 As an appetizer, we shared the empanadas de jaiba (crabmeat turnovers) which were served with fresh fruit pico de gallo and an avocado tomatillo sauce. They were perfectly cooked and crispy on the outside. The sweetness of the fruity pico de gallo contrasted well with the crabmeat. Jaiba is the word for crab in certain Latin American countries including Mexico. Time for the bigger plates. We had some enchiladas suizas(Swiss enchiladas with tomatillo sauce and chihuahua cheese) which tasted pretty standard for a Mexican restaurant of it's tier but still really good. To seal the deal, we tried the grilled skirt steak marinated with chiles and grilled with chihuahua cheese. It was served on a hotplate to keep the cheese grilled and soft enough to enjoy decadently with each bite of the steak or by itself. Served with a side of rice corn and beans. The entire meal was fantastic. Rosa Mexicano is priced fairly for its upscale feel and great quality. Appetizers are $8-$14, Tacos are $13-$15 and Entrees are $17-$22. I recommend going for lunch since dinner is more expensive and definitely have some margaritas with the guac. An intense craving for seafood a few Saturdays ago led us to take the journey beyond burritos into the world of seafood. We really wanted to experience a true New York seafood experience while adding some Latin flavor. If you ask most New Yorkers where to go for a complete seafood experience, they’ll point you to the Bronx or a little island Southwest of the Bronx called City Island. Without reading reviews we blindly decided to check out Tapas, a seafood restaurant in City Island that specializes in Latin cuisine. The day was sunny and the drive up there was a welcomed break from the city rush. City Island was originally named New City Island to rival Manhattan as a seaport town. Throughout the years it has sustained itself primarily on maritime industries such as boat building and fishing. Now it struggles to maintain the small town feeling as it gets crowded with weekend restaurant goers. We parked in a rocky parking lot in the back of the restaurant and realized there was no view of the water from any seat in the house. This was sort of a disappointment since other, more affordable restaurants in City Island offer outdoor seating next to the water. We sat down and were greeted by a waiter who was probably no more than 14 years old. I didn’t know whether to ask for a suggestion on the menu or whether he could suggest some good Saturday morning cartoons. Jaquie and I both agree that the best food item we tasted was the bread. It was freshly baked with no special frills; it was just a crispy outside and soft and warm inside. We skipped the appetizers since we polished off two baskets of bread and were noticing from other customers that the entrees could easily feed two people. Jaquie’s paella was orange; a sure sign that saffron was either not used or paired with a large amount of tomato sauce. Lesson learned, before you order paella make sure it’s authentic yellow paella made primarily with saffron. Saffron is a very expensive spice and some chefs might replace it with other ingredients to cut costs. As if the paella wasn’t defunct already, the plate also included quite a bit of chicken which is not traditionally a meat that is included in this dish and wasn’t called out on the menu when listing the proteins. Jaquie was not happy and neither were the paella gods. I ordered the seafood platter in butter sauce. It included lightly breaded tilapia, shrimp and calamari. I am obsessed with butter so I didn’t mind that the entire plate was swimming in a buttery garlic sauce. The first few bites were delicious but then the sauce overwhelmed even a butter sauce fanatic such as myself. Tapas does not deserve a return visit except for the bread, especially given the high prices for sub-quality eats (entrees are $20-$30). We figured if we ever do return, we would split one appetizer and overdose on the wonderfully baked goodness. Jaquie indulging in some lime and tabasco. Now that's what I call "easy to please". A Saturday of beach volleyball reminded me of my visit to Rio di Janeiro. Sunny beaches, caipirinhas, the most amazing tans in the world and feijoada (Brazilian national dish- Black bean stew with tender meats). so I asked my friend Carlos who has a weird obsession with Brazil, where we could find some delicious Brazilian food. His suggestion was Malagueta (25-35 36th ave/(718) 937-4821), a small restaurant that breathes passion for its food. 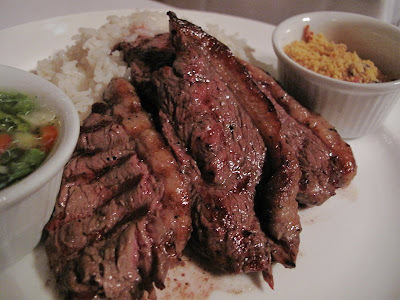 But before I write about the food, I want to simply state my admiration for the Brazilian culture. There is so much soul, energy and undying passion in every artistic element. If you have not witnessed this first hand, I suggest you search the web for videos of Brazilian samba, capoeira, soccer, and the famous carnaval. But nothing will make you understand better than tasting this food. We walked in and immediately conjured up our game plan. As always, we’d planned on sharing everything. We started with some empanadas that were actually cold in the center, but everything was so delicious that we felt guilty complaining. At the same time there was no way we could enjoy crispy ground beef goodness at the temperature of the refrigerator. So we told the waitress and she immediately gave us a new order that were literally taken out in just a few bites. They were delicious! We also enjoyed the most brilliant crispy yuca fries we have ever tasted with an herby garlic mayo served with chorizo that was seasoned just right and cooked to perfection. It's tough to go wrong with chorizo but celebrating is a must every time it's prepared with such excellence. 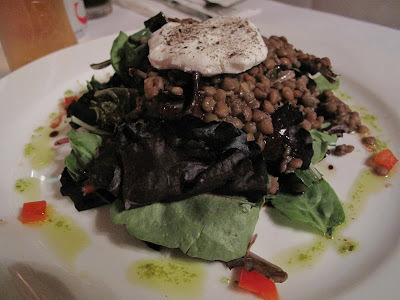 Carlos, having been there previously, suggested the lentil salad with goat cheese. Before trying it, the combination did not sound appetizing, but once it all came together it seemed like magic. The goat cheese slightly overpowers the other flavors but the texture is enough to make this an outstanding salad. 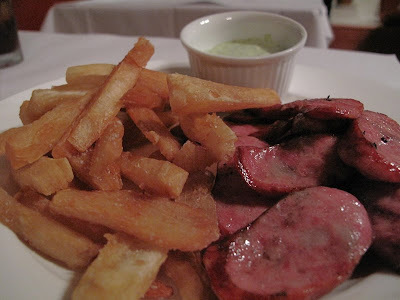 If you are going for the feijoada, I suggest an early Saturday dinner. While we got the day right, since it’s only served on Saturdays, they had run out of the popular dish by the time we got there. It was a tease especially because the lady sitting next to us had gotten the last of it and was slurping up the last of her black bean stew. With plans of returning, we ordered the steak, which was cooked medium and just right. This was Jaquie’s favorite. The texture of the dish was impeccable. And it came with my favorite Brazilian side, farofa (roasted cassava flour) mixed with black beans and rice. This combination completes the wonderful combination of rice and beans. Simple and delicious. 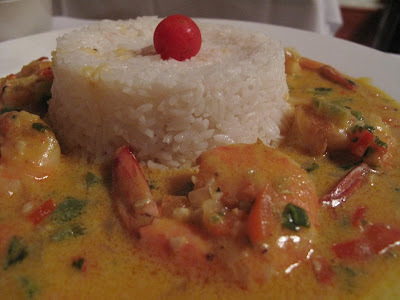 My favorite dish of the night, along with the yuca fries, was the coconut milk shrimp. The sauce had just enough of the coconut taste without being overpowering. I definitely recommend this small corner restaurant, and, on a side note, we also suggest asking for their signature hot sauce, which the waitress was kind enough to tell us about. She enlightened us with the addition towards the middle of our meal and helped finish off all the last bites with explosive kicks. OH and it can’t go without saying, congratulations to the Brazil national soccer team for winning the confederations cup. Check out Carlos’ new blog as he goes on 27 first dates to get back to the essence and help guys out with some low budget creative dates in NYC.